Business User use : A cosmetic good product company have different production unit in different region in different country in Europe and UK .Different country have different production cost and revenue separately. The company headquarter is in USA and the revenue is calculated in US. Now the company what to move to SAP HANA platform to implement its use cases( for production cost and revenue generation planning and forecast ) from their traditional systems. Now before implementing it HANA solution Architect need to find proper implementation scenario to implement it .So after looking into the use case we can find that exchange rate is a key player. if Exchange rate fluctuated then difference between Actual revenue in USD and the forecast revenue will be huge with respect to the different country production cost. So we need to an application which will provide a constant source of exchange rate and inside HANA application we can monitor and track the change of exchange rate. When we find a difference that might cause a damage HANA application should alarm to the business analyst. We can see the for the above use case only reading of data (exchange rate) is required to HANA Systems is required . No nee to write those exchange rates into HANA DB. So we will go with replication scenario. Rejection reason of Cloud on SAP HANA: Here response time is the key. within a sort time we need to process a large amount of data(rate) ,analyze it and need to put it to the model to check the forecast result. so SAP HANA via service like amazon or SaaS will take time to analyze it. Hence it is rejected. Rejection reason of SAP business Analysis: In this scenario is required when data is coming from SAP business one by mirroring the SAP HANA DB. This is not match with the use case . Hence it is rejected. Rejection reason of Accelerator Scenario: In this scenario the data or message will be sent to applications rather than user from HANA systems. Here data feeding required to HANA systems not from HANA systems. Hence this scenario rejected. Now we have three scenario left to implement in step 2( Data Mart.Apps and Content Scenario). 3. Now if we can see that in content scenario the data flow along with the report is standard SAP content and the data scope is from SAP applications. But here we need real time exchange rate data from the third party application (which is not SAP application) feed to HANA application . Hence this scenario rejected. 4. Data exploitation product like excel will not solve this as tailored apps is required that will use SAP PAL or R to track and ,monitor analysis the exchange rate data. Also data feed in real-time is required to HANA from third party application. So apps scenario is appropriate to implement for this use case. Data mart scenario is rejected as data is coming via batch and not real time . 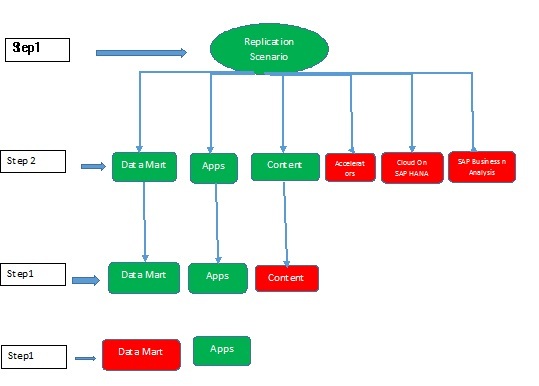 Below is the example of how to select and implement a business use case using SAP HANA Apps replication scenario. In the next blog I will go through with another scenario.